Remember those new years "Not Resolutions"? I thought it seemed like a good time to do a first progress update on them - I'm keen to try to do that a few times through the year - mainly to keep myself accountable more than anything else, but also to help with tracking my own progress. I'd be the first to admit that somewhere I tend to fall down on this sort of goal-setting is to fail to review things, and so lose focus - so one aim for this year is for that not to happen. - I will aim to reach a minimum of 5,000 steps per day. There will be days when for whatever reason I won't manage this, but the average across a week is the important thing. I'm right there on this. There have been a few days I've not reached the 5k level for various reasons, but the majority I've been well over it, and so far my average over a month is looking great! This one has been a real learning curve for me - sop many times in the past I've set "10k steps a day" goals forgetting that sometimes this simply doesn't work with my life. - I want to concentrate on eating well - with a focus on learning more about foodstuffs that will potentially assist with a health issue I'm trying to work to overcome. Yes - and I'm prepared to tentatively say that I'm starting to notice a positive difference. I've embarked on a "reduced sugar month" for February too - although I don't have a particularly sweet tooth, I was keen to identify the areas where I DO consume more refined sugar than is perhaps good for me, and so far this seems to be working. - Continue with a general plan to Eat Less, Move More - again in a bid to assist with the health issue. Yes. They say a month is sufficient time to form a habit - the moving more part of this has now been over that time and it has started to feel as though it's become part of my regular life. I've now introduced the dietary stuff to that as well so I'll see how it goes. I don't do diets, I don't do scales, so my only measure for this will be how I feel generally. - Continue using my Bullet-ish journal to help with planning and general organisation HOW did I not know about these earlier? Absoloutely genius idea - I can quite happily pick it up and add a few notes at lunchtime, and it's turned into my absolute "go to" for checking on dates, arrangements, and things that need doing. - Look into yoga classes locally or if there is anything good I can do online - again this is related to the health issue On the back burner for now - one thing at a time or things get overwhelming and that's counter-productive. We want to continue with the works on the flat, initially to make it a lovely place for us to live, but also to add value. - New door and window to be fitted to the kitchen Done - and making SUCH a quality of life improvement already! - New front door to be fitted Also done - and again the quality of life improvement is there already. It's a pleasure - if slightly odd - to come home to a door that looks so nice. - Hallway to be refloored/redecorated. - Decluttering on a minor scale - focus on seeing items within the house that we don't use 1 cupboard saw a full bin bag full of old paperwork, and assorted oddments of computer paraphernalia that is so out of date it's no longer worth keeping, along with old appliance boxes and similar head to the rubbish, and a carrier bag full of oddments for the charity shop, too. That in turn has freed up more storage in that cupboard. - Work consciously on using the things we have - whether that's foodstuffs, or useful items. The plan to eat from cupboards, larder, fridge and freezer ahead of the kitchen refit is going well - albeit my depleted cupboards are starting to make me a little nervous! - I will keep a good eye on interest rates and make the most of any access we have to higher interest savings Again, ongoing - a new regular saver account was opened when the old one matured in January, and the money to pay for the works on the flat is coming from our lowest-interest savings accounts. - I would like to have paid off at least £700 from the 0% card by the end of 2017. So far £105 of this has been paid off - my £700 target equated to £58 a month and I'm well up on that. - The paying down of the 0% card is to happen as much as possible without dipping into savings. Savings are untouched so far, and the money for the phone and the camera - the two items that were balance transferred to the 0% card - has been shifted into a separate savings account so I can keep track. - Aim to make £30 extra per month minimum via surveys, cashback etc to pay against the 0% card A little over £50 so far, with some more to pay out. - Keep doing it! Very little so far this year - weather has rather stopped play. I do however have a possible opportunity to explore a new area of photography that I've not touched on before, which will be interesting if it comes off! - Continue to work on gaining confidence in friendships I won't be going into much detail here on this one - it's a more public space than I feel comfortable including too much on this very personal issue. - "Let it go" and "This too shall pass" Mindfullness. - Try not to feel hurt or upset when other people behave unpleasantly or unkindly - I can't control their behaviour, I can control my reaction to it. Yes - this one is all about reminding myself that when someone behaves this way it says more about them, than about me - but my reaction says more about me, than about them. Food for thought. - Tidy up both laptop and desktop in readiness for the new Airshow Season. - Have fun - make the most of situations that offer themselves to me, and be brave enough to take them up. well the photography thing I mentioned above may be the first of these for the year! - Try to tick a couple more items off our big "We want to..." list. Planning a trip back to Cornwall in a few months. Generally speaking at the moment, life is good. The one thing from above that has so far surprised me the most is the difference I'm feeling as a result of being mindful about refined sugar. I've identified habits that I didn't really know I had, but have also confirmed my suspicion that I'm really not someone who generally speaking eats a lot of sweet stuff. On that basis I don't feel that a "no sugar" target is particularly relevant to me - but I am actively researching what sugar is in the foods I choose, and cutting back where appropriate. Just in the 9 days I've been doing this, I feel like I have more energy - which is a surprise as if anything I'd assumed that the opposite would be the case, but this could be as a result of the healthier choices that are being made as a result of thinking about sugar? I've established that I tend to have a habit of eating sweet stuff at weekends - a cake after tea on a Saturday for example, and that is something I can consciously seek to change. There are foods with added sugars that I won't be giving up any time soon - bread for example - and others that I've always been able to easily say no to in any case - chocolate. I may do a full blog post on my findings from the sugar experiment at some stage - watch this space! As we started to plan for getting the kitchen done, it suddenly occurred to us - we have an awful lot of stuff in that kitchen, and before too long, it's all going to have to be stored somewhere! Quite a scary thought, to be honest. But it didn't take too much time for us to realise that it was relatively easy to turn that into a mini frugal-food-challenge! So, for the past couple of weeks I've been focusing the meal plan around using up contents of the cupboards, fridge and freezer. As and when it comes to time to start clearing the room we'll be switching on Freezer 2 and transferring the contents of freezer 1 over to there, but we will also need space in there to store "home made ready meals" that we can easily heat up in the microwave while we're without full cooking facilities. Things like Chilli and bolognese are going to feature I think, and we'll have the camping stove as well which will give us a single ring "hob". For the moment though it's all about using what we have - so the first thing was to go through the cupboards so we knew what we DID actually have. Some things took us by surprise a little - the pack of sugar free jelly crystals that went out of date in (I think) 2008, for example. We can be quietly confident that there is nothing much natural in those, as they smelled, looked and tasted exactly as normal! 5 tins of red kidney beans also came as a little bit of a surprise, along with 8 cans of baked beans. Yes. 8. No I have no idea. Other things less so - half a jar of smoked peanut butter which never quite hit the spot on toast. About half a pack of pudding rice - it takes an AWFUL long while to use up a bag of pudding rice you know! Quite a bit of dried fruit - that's a conscious choice to have though - I like to know if I want to make flapjacks or similar, I've got the ingredients to hand. Sometimes "using things up" can lead you to discovering new ideas that for whatever reason you hadn't thought of before. A few rashers of bacon fried and stirred into baked beans for example enlivened a standard jacket potato up no end. It's not that it's anything new or revolutionary, just simply that I'd never thought of combining the things like that that. That peanut butter has been added to Thai style veggie curries - also using up coconut milk - to turn them into a sort of satay flavour - really tasty! I've also tried one recipe that I've talked about for ages and never previously got around to trying - Clafoutis - essentially a batter pudding, traditionally with cherries in it. We had a lurking can of black cherries donated by a friend who bought them then remembered she doesn't like cherries! A resounding success - and rather than a batter, as such, the recipe I followed gives almost more of a set custard. 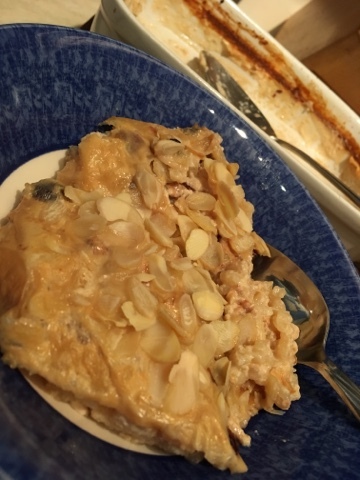 Rice pudding with dried cranberries added, finished off with flaked almonds on top to toast for the final 30 minutes of cooking was another success. Apologies for the shoddy photo. I was anxious to get on and eat it! The reward for this effort is already starting to show, both in diminishing food cupboards, and in diminishing food bills too - so it's definitely working on all levels. I'll be carrying on for the foreseeable future as I work through things, it's requiring some thought when it comes to the shopping list as I have to remember to add those "storecupboard" ingredients that have already been used, but only in the quantity that they are required for the upcoming week's meal plan!